Edens Garden is an oceanfront single-family cottage located at the mouth of Netarts Bay and Hodgdon Creek, near Oceanside and Tillamook, Oregon. 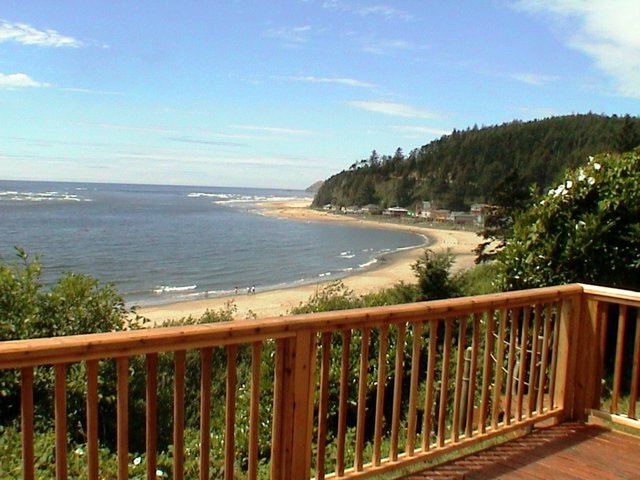 The cottage overlooks Netarts Bay, the Oregon Islands Wildlife Refuge and the Pacific Ocean. Its on a bluff over the beach - with lots of windows and spectacular views. You can walk from the cottage directly to the ocean beach on our private path, or lounge on our deck, which overlooks the Pacific. Eden's Garden is two stories, has three bedrooms and sleeps up to 10 comfortably. If you need more space or a smaller space, also consider The Blue Rose Cottage next door.